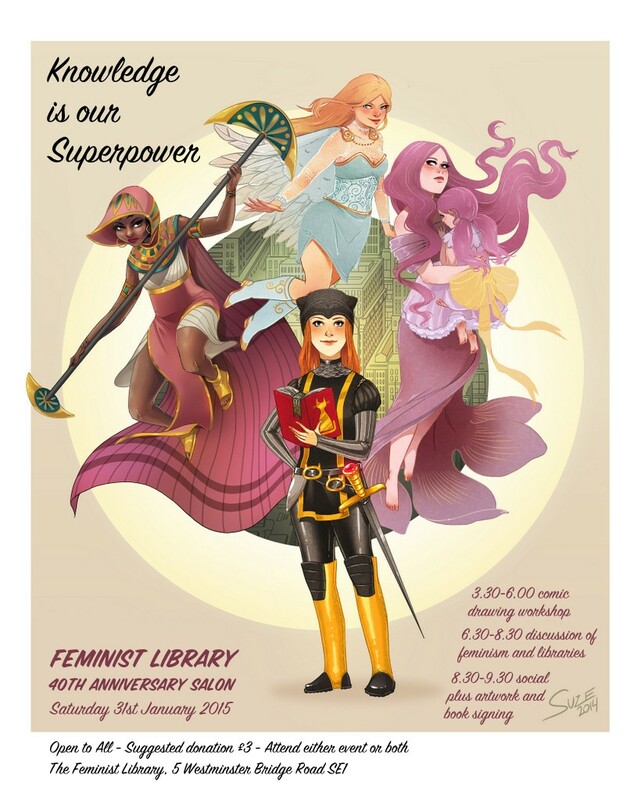 A free comic workshop led by artists Sally Jane Thompson, Rachael Smith, and Karen Rubins in London at The Feminist Library? I’d signed up faster than you can say sequential-art-salon-in-Southwark. You never know exactly what to expect from a workshop, but the best ones tend to have a healthy mix of facilitator-led guidance and encouragement for participants to go off-piste and develop their own work. Certainly, I’ve been to workshops in the past that would have been more truthfully advertised as self-indulgent monologue-fests. The comic workshop at the Feminist Library was a participatory haven and an example of how workshops should be: friendly, informative, and fun. All materials were provided, and the roundtable setting meant that Sally, Rachel, and Karen were interspersed with workshop participants, with everyone sharing tips and chatting animatedly over tea as we drew away to our hearts’ content. The format for the workshop was a comic jam—you divide the page up into four frames and fill in one of the four frames before passing it on to your neighbour. Other than the basic framework guidelines, we had no constraints, and this meant that ideas were varied and fruitful—the stuff of the everyday and of fantasy. We had aliens discovering the joys of supermarket reduction aisles. We had caped crusaders jousting with masked menaces. Some comics started out happily enough before ending in apocalyptical terror, while others began as tales of damp-ridden bedsits only to result in scenes of Dionysian excess. Many were autobiographical, including feeling out of place at a party, having to defend feminist beliefs in face of scorn, or grief over a lost child. Karen Rubins, who runs regular comics workshops, enthused about how rewarding it is to see people who enter the room as complete strangers come together to work on comics collaboratively, bouncing ideas off each other and creating everything from absurd to humorous to profound art. She also remarked on how interesting it is to see how much people can do when limited to a four-frame constraint—the stories, while short, can be paced however the creator chooses, meaning that in four frames you can have a narrative that spans a few seconds or even decades. The activity also had the effect of inspiring participants to include comic workshops in their day-to-day jobs. I got talking to workshop attendee Celia, who teaches English to migrants and refugees, and who left with ideas for lesson plans incorporating the use of comics to express personal stories of migration and settling in the UK. This workshop formed part of an all-day salon: “Feminism and Libraries: Knowledge is our Superpower,” the first of a series of 40th anniversary commemorative salons at The Feminist Library. The theme of the day was the celebration of the guardians and disseminators of feminist knowledge and history. Librarians, library assistants, volunteers, pamphleteers, archivists, discographers—the unsung superheroes who battle against increased rents, public sector and arts funding cuts, and a general climate of corporate takeover—factors as loathsome as any Marvel villain—with an unwavering belief in and dedication to their work. I went away full of hope—there are many debates about feminism, and indeed many feminisms, and it strikes me that the medium of comics is an excellent one through which to enter these debates, especially in this flourishing culture of self-publishing, small press, and interdisciplinary creativity. To find out more about The Feminist Library’s collections and upcoming events, follow them on Twitter @feministlibrary. Karen Rubins is a comics creator and illustrator living and working in London, UK. She has been making comics since the beginning of the century, and enjoys collaborative storytelling in all its forms. As well as writing and drawing, she runs workshops, clubs, and courses for all ages. She writes a spooky kids comic series The Shivers, but also works in other genres including comedy. Follow her on Twitter @Kazmantra. Rachael Smith has self-published several comics such as The Way We Write, Flimsy’s Guide to Modern Living, and I Am Fire, which made Forbidden Planet International’s “Best of 2013” top ten list. Smith went on to release Clara’s Shadow via David Lloyd’s (illustrator of V for Vendetta) publishing house Aces Weekly, and her debut graphic novel House Party came out earlier this year with Great Beast Comics to critical acclaim and made Forbidden Planet International’s and Broken Frontier’s “Top 10 comics of 2014” lists. Smith is currently working with Titan Comics on her monthly strip for the Doctor Who: Tenth Doctor comic series, working on her new book The Rabbit, and was recently nominated for the Emerging Talent category in the 2013/14 British Comic Awards. Follow her on Twitter @rachael_. Sally Jane Thompson is a freelance comic creator and illustrator. She’s the author of coming-of-age graphic novel Atomic Sheep, published by AAM Markosia, as well as numerous short comics for web and print. She has also contributed art to projects like Womanthology: Space and Liberator Volume 1. Follow her on Twitter @SallyThompson.